The seasonal changing of the clocks marks a wind down in cycling in the northern hemisphere as days become shorter and the longer nights mean less opportunity to get out on the road after work. Inclement weather is another disincentive to putting in the miles. To avoid the dangers of riding in the dark and the misery of rain, sleet, and cold many keen riders will be dragging a turbo trainer or set of rollers out of storage and thinking of ways to make the tedium of cycling without forward motion bearable. By happy coincidence I recently came across this article from The Morning Times (Washington, D.C.) of 23 December 1896 while browsing The Library of Congress newspaper archive site. Schock’s long experience in racing has taught him the danger of relying on good weather for training preliminary to a contest, so he has had constructed an unique machine, by which he can reel off any number of miles inside of a six-foot space. His bicycle is swung in a peculiarly built frame, so that the driving wheels rest on rollers, with which dial registers are connected, thus indicating the distance travelled. This dial is in full view of both the rider and the spectator, so the progress of the spin can very easily be watched. Schock says he can make a mile on his machine well inside of three minutes. Albert Schock was a professional cyclist who rode on the American and European six-day circuit in the 1880’s. Earlier in 1886 he had set a world distance record for a six-day race of 1,009 miles and 3 laps at the track in Minneapolis. Hailing from Chicago he clearly understood the detrimental effect that winter weather can have on a cycling training regime, hence the invention of his ‘training wheel’. 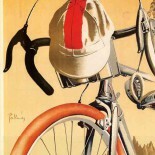 Though certainly one of the earliest bike trainers it was not the first. The Národní technické muzeum in Prague houses a collection of bicycles in its transportation hall which includes this penny-farthing bicycle trainer dating from 1884. The collection also houses a ‘safety’ bicycle trainer designed by Voldřich between 1890 and 1900. While a more technical set-up can be seen in this advert for the Standard Bicycle Trainer from the pages of the Narragansett Machine Company’s 1905 Catalogue of Gymnastic Apparatus, a snip at just $200. Advert for the Standard Bicycle Trainer from the Narragansett Machine Co. Bicycle rollers have an equally venerable history as evidenced by the wooden set on display in the United States Bicycling Hall of Fame. These are contrivances, more or less ingenious, upon which a cyclist can take exercise at home. Sometimes they are so designed that the rider can fix his machine upon them and pedal away against a graduated resistance ; others are simple standards or pillars, carrying a saddle and a flywheel, with cranks and pedals, upon which riders can exercise in the same way. 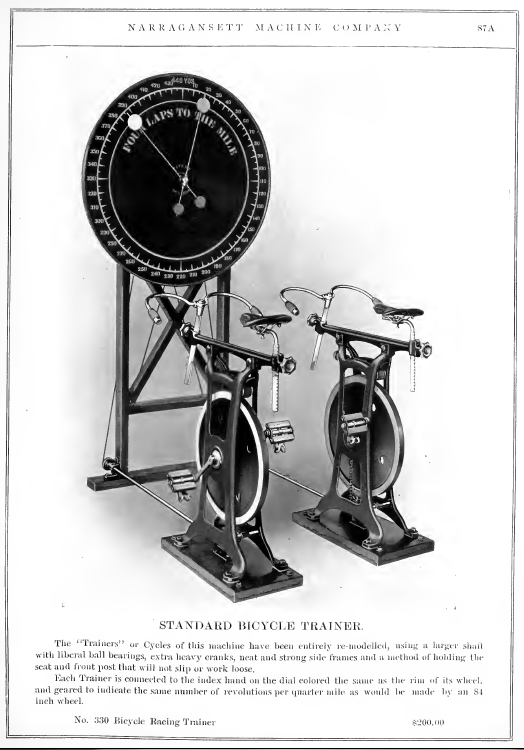 The use of these contrivances in gymnasia is not altogether to be commended, as in such places other exercises might well be followed by cyclists, and the actual value of the home trainer from a racing point of view is practically nil. None of the men who have shone on these machines have done any real good upon the racing path. Today of course the stationary trainer is part of the standard equipment of any professional cyclist, used both for training and for warming up before and warming down after a race. Pingback: [et_pb_section admin_label="Section" fullwidth="on" specialty="off"][et_pb_ctips_site_header admin_label="CTips Site Header"] [/et_pb_ctips_site_header][/et_pb_section][et_pb_section admin_label="Section"
This entry was posted on October 27, 2014 by aaroncripps in Cycling, Cycling Tech, History, Training Aids and tagged Bicycle Trainers, Cycling, Cycling History, Cycling Training, Home Trainer.